Nudges aren’t enough. Wage policy matters. In order to have meaningful retirement security, America’s low-wage workers don’t just need an effective way to save—they also need a raise. The State of California is leading the way by providing both. Thanks to a minimum wage hike to $15 an hour and an initiative that will help private sector employees save for retirement through automatic payroll deduction, low-wage workers in California can now look forward to a major boost in their retirement incomes. According to an analysis by the UC Berkeley Center for Labor Research and Education (known as the Labor Center), these combined policies will raise retirement income by as much as 50 percent—a huge advance for Californians’ financial security. Public discussions on retirement security tend to focus on retirement savings. After all, Social Security isn’t enough on its own, and few private employers currently offer traditional pensions. 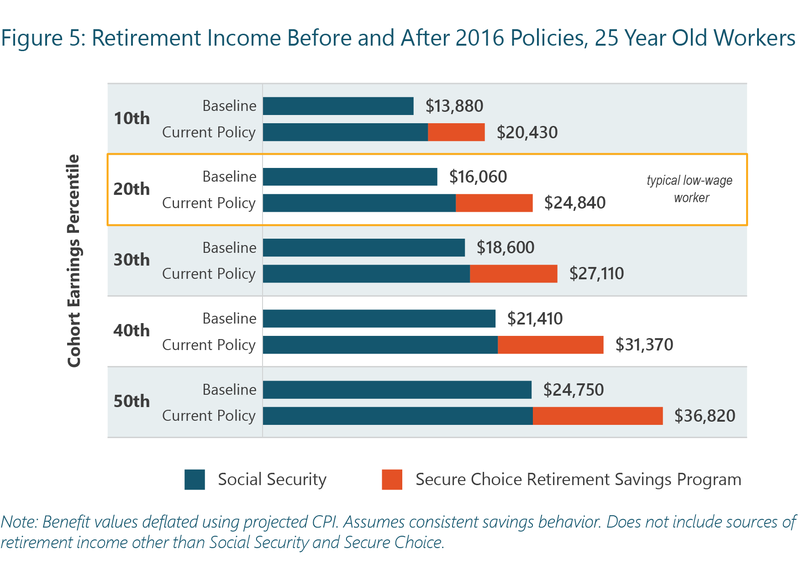 So it’s not surprising that emerging retirement security policies focus on improving private savings. Relying on insights from behavioral finance research, corporations and state governments are increasingly turning to auto-enrollment and auto-escalation of contribution rates to encourage workers to save, and to save more. While these efforts are valuable, there’s another critical, often ignored dimension to the retirement crisis: wage and income inequality. The bottom half of workers in the US have seen their incomes stagnate over the past four decades. Unfortunately, notwithstanding the successes of the national Fight for $15 movement, wage policy is rarely included in policy discussions about retirement security. The reality is that nudges, by themselves, aren’t enough to pull the US out of the retirement crisis. Low-wage workers can’t save their way into retirement security on their own when their paychecks barely cover rent and food. Wage policy matters for retirement security. In 2016, the state of California enacted two landmark laws that, together, will significantly improve both wages and retirement income among millions of workers. First, California raised the state minimum wage from $10 in 2016 to $15 in 2023, after which it will increase with inflation. Second, the state authorized implementation of the California Secure Choice Retirement Savings Program, which will require private employers with five or more employees to either offer a workplace retirement plan or enroll their workers in an automatic payroll deduction Individual Retirement Account (IRA) sponsored by the state. Workers can choose to opt out. Both policies will affect a broad swath of workers. The $15 minimum wage will result in raises for 38 percent of California’s workforce. Secure Choice — now called CalSavers — will give 60 percent of private sector workers an opportunity to participate in a workplace retirement savings plan. Roughly 70 percent of those eligible are expected to enroll. 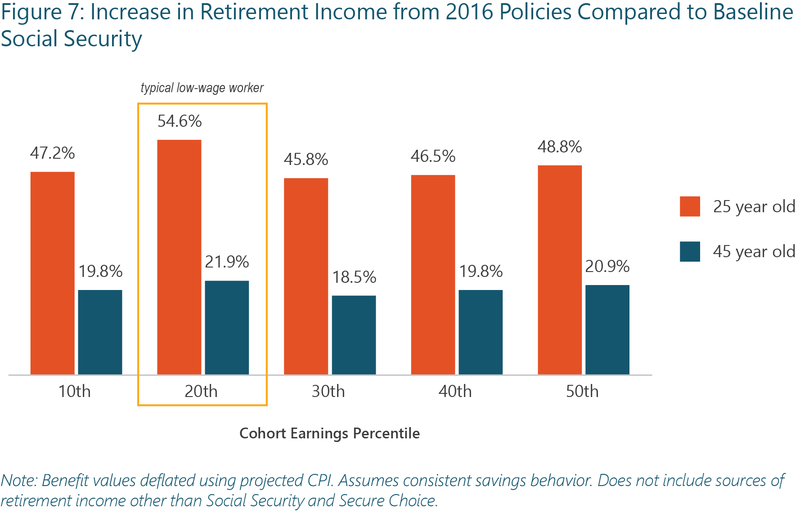 The Labor Center analyzed the separate and combined impacts of the new minimum wage policy and the CalSavers program on the retirement incomes of workers in the bottom half of the income distribution (including Social Security benefits). We found that for typical young low-wage workers, the $15 minimum wage law and consistent participation in retirement savings through CalSavers can increase retirement income by more than 50 percent, compared to the Social Security benefits they would have earned under the old minimum wage policy. The $15 minimum wage will significantly increase the lifetime earnings of low-income workers. For instance, the typical young low-income worker will see a 21 percent boost in lifetime earnings compared to the old minimum wage policy. The typical mid-career low-income worker will see a 15 percent increase in earnings during their remaining working years and an eight percent increase in their overall lifetime earnings. Increased lifetime earnings mean not just more money in the pockets of workers—it also means a larger Social Security check. For the typical young low-wage worker (earning at the 20th percentile of their age group), the $15 minimum wage law means an extra $1,700 in annual Social Security benefits (in today’s dollars) for each and every year in retirement. For low-wage mid-career workers, the Social Security increase will be more modest — about $580 a year. CalSavers is a game-changer for retirement wealth building among low-income families because the vast majority of low-wage workers do not have access to an employer-sponsored pension or 401(k), and do not own IRAs. (The program will also implement annual auto-escalation of contributions up to eight percent of pay, but we did not account for that in our study). The scheduled annual increases to bring the current minimum wage ($11) to $15 in 2023 and grow it in tandem with inflation will allow workers to save for retirement while still seeing a rise in take-home pay. They will also translate to higher retirement contributions and account balances. Under the old minimum wage policy, CalSavers would have enabled the typical young, low-wage worker in California to save enough to generate $5,800 a year in retirement income addition to Social Security. Increased earnings under the $15 minimum wage law will bump up that amount by $1,200, to just over $7,000 a year. For typical mid-career, low-income workers, CalSavers income increases from just under $2,000 a year to about $2,250. 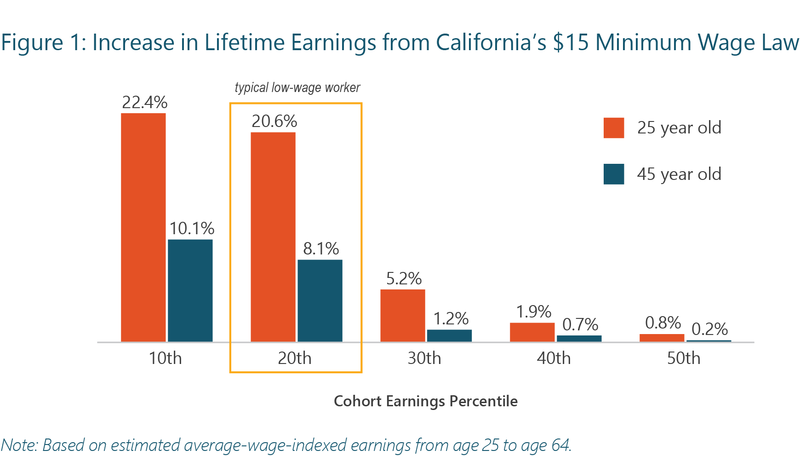 Together, California’s $15 minimum wage law and Secure Choice Retirement Savings Program can exert a powerful impact on retirement income security. A typical young, low-income worker, who previously would have relied almost entirely on $16,000 in Social Security benefits to get by, can now expect almost $25,000 in retirement income from CalSavers and Social Security combined. That’s enough to raise that worker above 200 percent of the Federal Poverty Level, a commonly used benchmark for near-poverty. Even mid-career workers, who have less time to save, stand to gain about 20 percent in retirement income, mostly from CalSavers, compared to baseline Social Security under the old minimum wage policy. While CalSavers always promised to be a major step forward for Californians’ retirement security, its combination with an increased state minimum wage makes it an even more powerful tool to combat elderly poverty. Other states considering or implementing Secure Choice programs should take note.